Ok, so I’ve struggled growing good peaches in Oakland. I had a Muir and one with a number from some field station. After three years, I got only 5 peaches. And the taste? Meh. A little bitter. A little mealy. Not the ecstasy that a peach should stir up. So I yanked the peach tree (I’m a bruiser), and sent it up to Chico, with a friend there, who might get better peaches in a hotter climate. But I did feel a certain…lack. Peaches, peaches, peaches–they are my favorite summer fruit. And so, I turned to adoption. Yes, you can adopt a peach tree. I had read David Mas Masumoto’s book, Epitaph for a Peach, about his struggles as a family farmer trying to grow heirloom fruit that isn’t exactly “shippable”. And I was delighted to find out he and his family offer peach tree adoption. Now, if I’m going to adopt a tree, Masumoto’s is the place where I’d like to make that happen. It’s a solution for a problem they have as small-scale growers–we give them money up front for the chance to pick the fruit of a one of their trees. The process required coming up with a name for our group–my buddy Zach came up with Power to the Peachful, and telling the family what we would do with the fruit. Our list included salsa, ice cream, peach liquor, canned peaches with rum. This all went down around March. The picking would happen in late July/early August. Now I’m a bit of a literalist. I thought I would be sent images of baby fuzzy peaches, and given gushing reports about my tree’s health (I also thought the money I sent to Heifer went straight to that goat for a family, but that’s another story). In reality, I found out we would be adopting a tree, and then I promptly forgot. Then July hit, and we got word that picking would happen July 18 and July 25. The farm is outside Fresno, picking started after orientation, one at 7:30am, another at 8:30. Our posse decided to camp outside of Fresno the night before. (Kelly’s Resort, check it out next time you are on the 99). The Masumoto’s had told us to be early because it’s hot in the Central Valley, and that we would be given boxes and brunch. Yay! And I’ll admit it, my brain also thought, besides worrying about my friends: all those peaches. We would go home. We had to just go home and not pick peaches. But after the car was towed away, and we packed all their salvagable stuff into our car, my friend looked at his watch: “We can make the 8:30 orientation! Let’s go!” And so we did. And the farm was the most beautiful thing I had ever seen, not because it was actually physically beautiful (it’s neat and the trees are lovely, and they are peach trees full of fruit but it’s pretty flat and non-descript) but because we were alive, goddamit and we were there to pick the peaches. The Masumoto’s were also the most beautiful family I had ever seen–so giving, so kind and concerned about our friends and our group. And so we picked. It turned out we had twins. The peaches were Elberta’s. Heavy and yellow. Dense. Golden. We got to climb orchard ladders and get every last fruit off those trees. We picked 16 boxes. 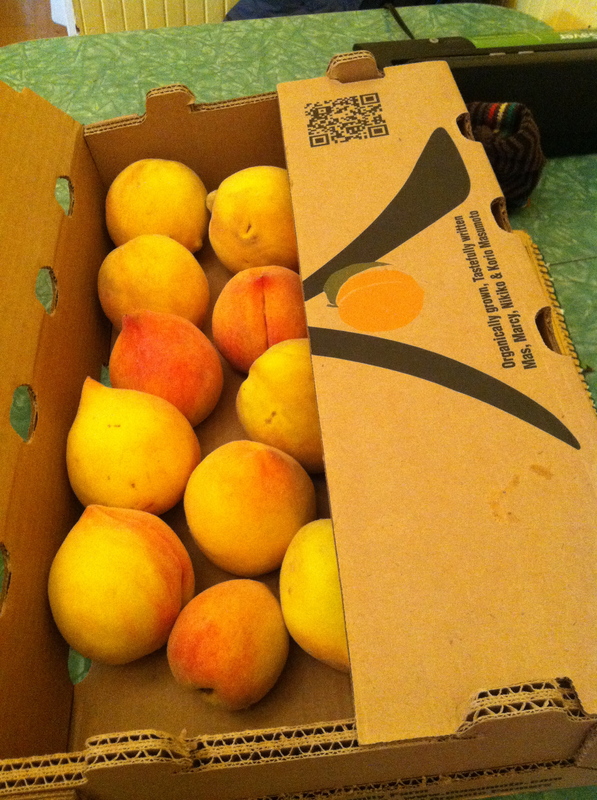 A kindly man told us he would take our peaches to Berkeley, where he lived, and we could pick them up later. We ate a delicious meal in the orchard. We were alive, laughing and talking. Then all the groups who had assembled there were told that the Masumotos were throwing in an Le Grand nectarine tree into our adoptive families. 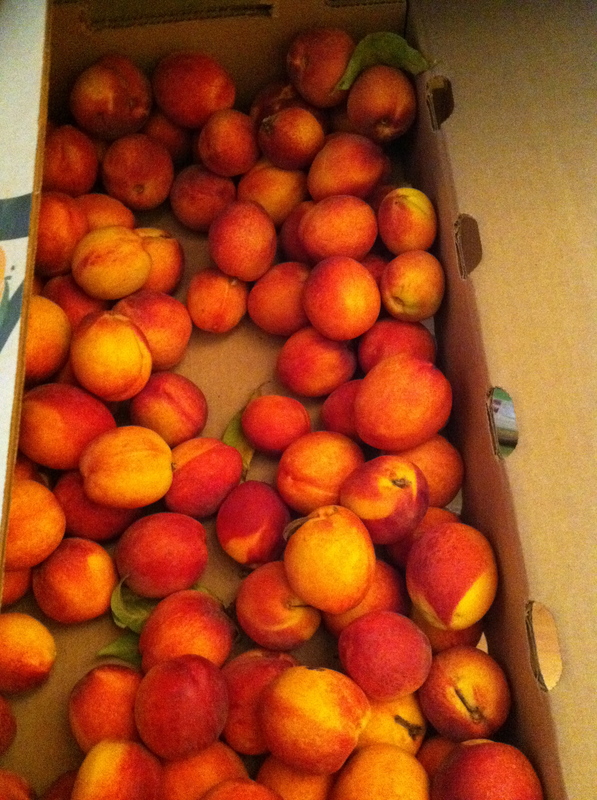 So we picked another dozen boxes of nectarines. They tasted like mangoes and sunlight. Another truck said they’d drop the nectarines at my place in Oakland. We were blessed. There are only a few times in life when such grace can happen, when you feel like yes, you are special and lucky, and that was what that day felt like. Now, back at home, I’ve just started the fruit processing odyssey. So far, I’ve made nectarines in syrup, nectarine and mulberry jam, peach ice cream, peach pie, and dehydrated peaches. As I slice the peaches, I think of my friends, who are bruised but happy, and I think they are the most amazing people I’ve ever met. When I asked them, “why did we go pick peaches after that accident?” They explained, “We didn’t drive down to Fresno to get in a car accident and go home; we drove to Fresno to pick peaches.” And ain’t that what life is all about? Speaking of amazing people, there’s a movie about the Masumoto family! It’s showing at SPUR this Wednesday, August 5th. I’m told it’s sold out–so let’s ask SPUR to have another screening!! 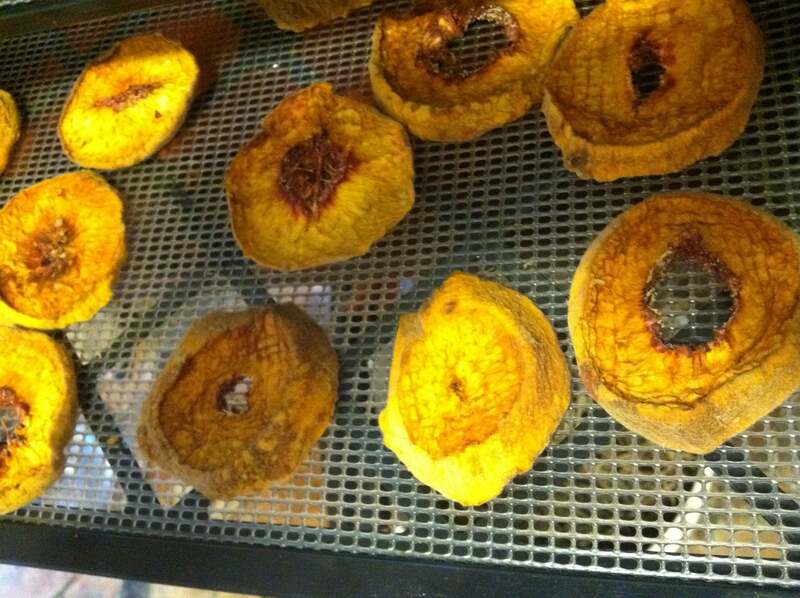 Hope the rest of your summer is peachy: next up is an blogpost about my field trips of the hacked version of Early Girl tomatoes, called Dirty Girls. I’m going to do a side-by-side taste test. This entry was posted in fruit trees, random thoughts. Bookmark the permalink. What a harrowing story! I’m surprised you were able to pull yourselves together to get to the orientation on time. Fresno is not such a long way from Pasadena…I would just love this! Yes! “We didn’t drive down to Fresno to get in a car accident and go home; we drove to Fresno to pick peaches.” That’s a wonderful sentiment. And what a terrifying moment… one I am sure you keep living over and over again in your mind… I am so happy your friends are ok! Great post; glad you are all okay! I am enjoying the peaches from my backyard this past week … glorious … mostly eating them straight, dribbling juice down my chin and splashing it on to my nose and clothing … glorious … but also peach pie and peach crumble, both fattening but delicious, too. Love the notion of a adopt-a-tree. So happy to hear you carried on to pick the peaches! My favorite thing to do with a mess of peaches is to make (and can) peach chutney. Here is the recipe I have used for years. I usually substitute cranberries for the raisins. http://allrecipes.com/recipe/75320/spicy-peach-chutney/ You can serve it with meat, Indian dishes or with cheese and crackers. It is amazing mixed with a grainy mustard on a sharp cheddar sandwich with arugula.